Valves are isopolar, narrow and distinctly arcuate, with length to breadth ratio 12–27. Valve margins are parallel through most of the valve, only slightly tapering near the apices. The valve width is remarkably constant (mostly around 3.5 μm) in specimens within the population. Apices are rounded and slightly reflexed dorsally. In LM, distal raphe ends on the valve face are distinct, short, and centered in the apical region. 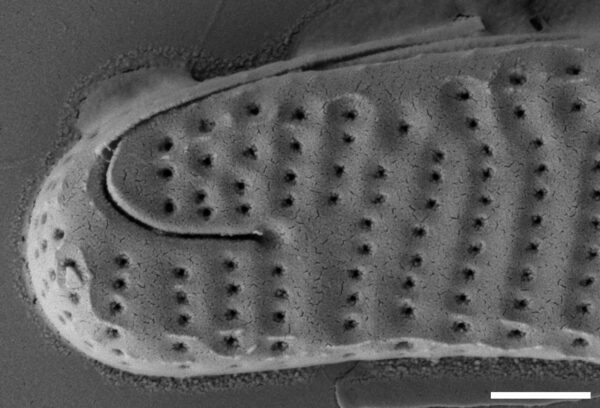 The distal raphe does not penetrate the internal part of valve past the helictoglossa, a feature visible only under SEM. The helictoglossa is small, but still visible in LM. 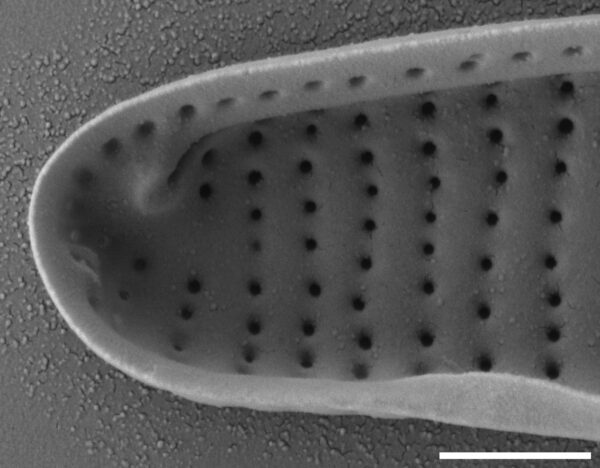 A single rimoportula per valve is placed at the apex near the helictoglossa. Striae are lowered in between small hyaline external ridges, parallel in the center of the valve, and radiate toward the apices. 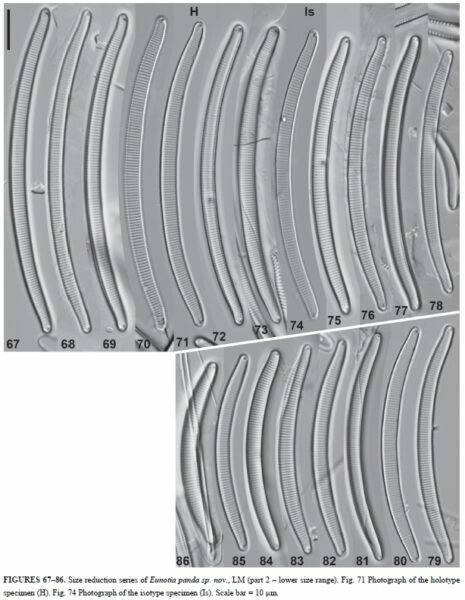 Both internal and external expressions of the areolae are open and rounded (externally with irregular edges), 33–40 in 10 μm. Eunotia panda was described from Acadia National Park, Maine, where it was common in ponds, streams and wetlands within the park. 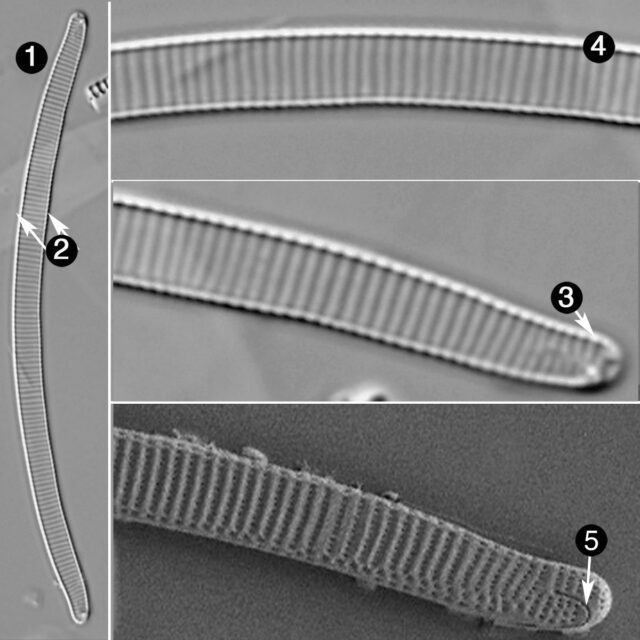 This taxon is probably more widely distributed in suitable habitats around the Holarctic region, but may have been unnoticed due to confusion with the widely distributed and variable E. bilunaris. Based on LM images published in Lange-Bertalot et al. (2011), E. panda also occurs in various localities around Europe: the spring of Odra River, Czech Republic (pl. 30, fig. 13), a peat bog in Tatra Mountains, Poland (pl. 27, fig. 7; pl. 31, fig. 14), and a peat bog in the European part of Russia (pl. 27, fig. 17). 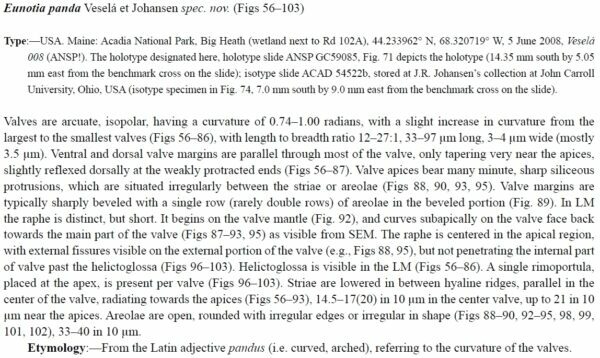 Valves are arcuate, isopolar, having a curvature of 0.74–1.00 radians, with a slight increase in curvature from the largest to the smallest valves (Figs 56–86), with length to breadth ratio 12–27:1, 33–97 μm long, 3–4 μm wide (mostly 3.5 μm). Ventral and dorsal valve margins are parallel through most of the valve, only tapering very near the apices, slightly reflexed dorsally at the weakly protracted ends (Figs 56–87). Valve apices bear many minute, sharp siliceous protrusions, which are situated irregularly between the striae or areolae (Figs 88, 90, 93, 95). Valve margins are typically sharply beveled with a single row (rarely double rows) of areolae in the beveled portion (Fig. 89). In LM the raphe is distinct, but short. It begins on the valve mantle (Fig. 92), and curves subapically on the valve face back towards the main part of the valve (Figs 87–93, 95) as visible from SEM. The raphe is centered in the apical region, with external fissures visible on the external portion of the valve (e.g., Figs 88, 95), but not penetrating the internal part of valve past the helictoglossa (Figs 96–103). Helictoglossa is visible in the LM (Figs 56–86). A single rimoportula, placed at the apex, is present per valve (Figs 96–103). 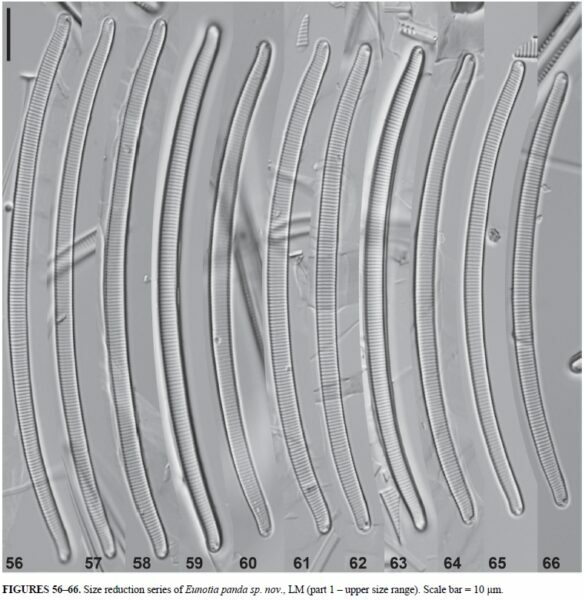 Striae are lowered in between hyaline ridges, parallel in the center of the valve, radiating towards the apices (Figs 56–93), 14.5–17(20) in 10 μm in the center valve, up to 21 in 10 μm near the apices. Areolae are open, rounded with irregular edges or irregular in shape (Figs 88–90, 92–95, 98, 99, 101, 102), 33–40 in 10 μm. Valves are isopolar, narrow and distinctly arcuate. Valve margins are parallel throughout most of the valve. Valve apices are rounded and slightly curved toward the dorsal side. Valve width is relatively constant, near 3.5 μm. The distal raphe is strongly recurved, nearly 180 degrees.